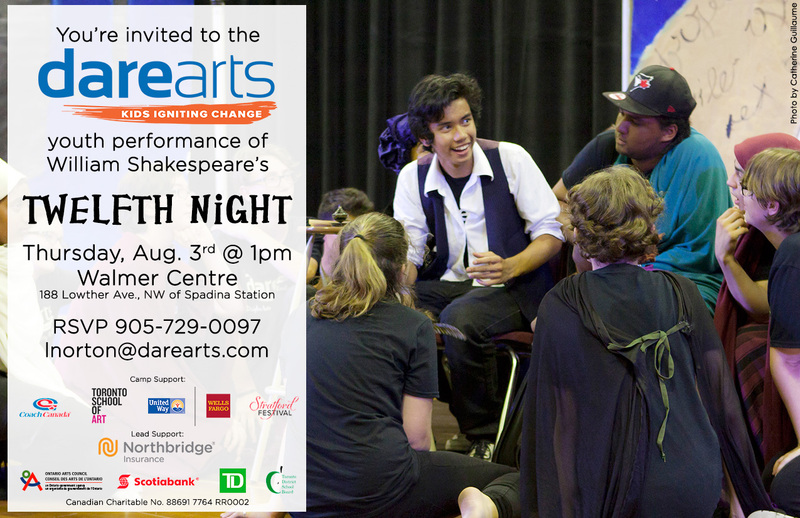 Next Thursday, August 3rd at 1 pm, 25 of Toronto's at-risk teens will present their own abridged version of Shakespeare's 'Twelfth Night', a musical comedy of disguises. The play is part of this season at The Stratford Festival. The youths' showcase is the culmination of eight days of DAREarts Summer Camp, a program that empowers at-risk youth to be leaders using the arts. The youths engage in visual arts, drama, stage combat, literature, fashion and dance of the times of William Shakespeare (400 years ago). Led by DAREarts lead teacher and dance choreographer, Laura MacKinnon, and renowned director & stage combat choreographer Jennifer Parr, the team also includes musician Ciara Adams, visual artist Tina Oehmsen-Clark of the TSA, Artistic Director of Shakespeare in the Ruff Kaitlyn Riordan, DAREarts Lead Teaching Assistant Mackenzy Willis and DAREarts Coordinator Lisa Norton. 'DAREing' to practise empowerment through Discipline, Action, Responsibility and Excellence, these young teens are choosing to spend their holidays exercising creativity and team work while learning leadership as alternatives to the negativity that surrounds them. Youth volunteer Dexter, 16, said, "…it's really cool to see the kids come into their own when in character." The youths gain further insights when they attend the Stratford Festival's professional production on Friday, July 28. DAREarts Founder, Marilyn Field, says, "DAREarts youths use the arts as tools that build their courage and confidence to tackle life challenges. Dealing with the challenges of Shakespeare's characters emboldens them to overcome their own." The full circle of the DAREarts vision is to see these teens, as delegates for their respective communities, returning to their own lives and neighbourhoods empowered by the steps that they have taken to take a leadership role in sharing their experiences and igniting change in their community. DAREarts is a Canadian charity which stands for 'Discipline, Action, Responsibility and Excellence'. DAREarts works with 9-19-year olds in high-priority neighbourhoods, empowering them to be leaders. In 21 years, DAREarts has influenced over 200,000 children to ignite positive change in their lives. www.darearts.com. DAREarts thanks its supporters led by Northbridge Insurance, Scotiabank, TD Bank, Anne Livingston and the Ontario Arts Council (an agency of the Government of Ontario) plus its summer camp supporters, the Toronto School of Art (TSA) and Wells Fargo - United Way Worldwide. 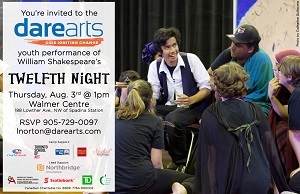 DAREarts teens shine with Shakespeare.